The July 31 trade deadline is fast approaching, and it’s time for teams to start thinking about moves they want to make. Some will be getting their garage sale signs ready, while others will be scouring the market for additional pieces to help for an impending playoff push. The Cleveland Indians fall into the latter group. At 47-40, the Tribe sits in first place in the AL Central, but only by 2.5 games. Much of this is due to a good deal of under-performing through the first half of the season. Still, Cleveland is expected to be a buyer again, hoping to find some outside help to get back to the World Series. Of course, you can’t be a buyer without being willing to part with some prized possessions. Likewise, the Indians have more than a few quality prospects which other teams will be aiming for. While this is all to be expected, there’s one player the Tribe should be incredibly hesitant to move despite being in a win-now situation. 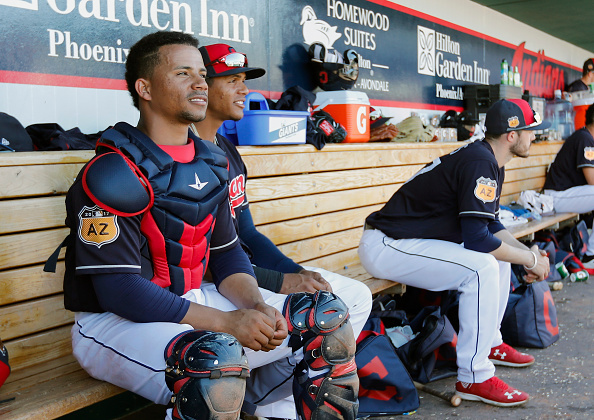 Catcher Francisco Mejia is seen by many as one of the best prospects in baseball, and should be seen by the Indians as untouchable at the deadline. There’s a good chance you’ve heard Mejia’s name a few times over the past season or two, even if you’re not an Indians fan. The Dominican just finished his second straight appearance in the MLB Futures game, and made headlines last summer with a 50-game hitting streak in the minors. Currently, Mejia is boasting a .339/.382/.546 slash line in Double-A Akron, while also contributing 34 RBIs and nine home runs. Yet another successful season has resulted in his name being mentioned as one of the best prospects in baseball. Rankings from both Baseball Prospectus and ESPN’s Keith Law have Mejia placed in the top ten. While the Indians likely love how quickly Mejia is ascending, they know this also means his name will be mentioned any time they attempt to make a trade. It’s a near-common belief that, if Cleveland wants to make an impact deal, it’ll be difficult to complete without moving its up-and-coming catcher. As mentioned earlier, I can’t stress enough how badly the Tribe needs to resist including Mejia in trade talks. Sure, it’ll be tough for Cleveland to make a significant deal without parting with prime prospects. At the same time, this is a team that doesn’t necessarily need an earth-shattering deal. While the Indians left a lot to be desired in the first half, they shouldn’t feel as though they need go for broke at the deadline. Their bullpen is one of the league’s best. The offense has struggled, but due in part to typically consistent contributors hitting slumps. The starting pitching could be better, but did appear to be settling into a groove as the All-Star break approached. I’m not saying Cleveland should stand pat. Some moves should definitely be pursued, but this should be done without including Mejia. With the team recently confirming the catcher isn’t quite ready to come up just yet – and may not be at the start of next year – some may feel as though he shouldn’t be hidden from trade talks. If he can’t help the team win the World Series this year, why not use him to see if you can acquire someone who can? This is true, but I still can’t get on board with moving the best prospect in the farm, one who’s improving at an alarming pace. On top of this, catcher still seems to be an area of concern with Cleveland. Though Mejia probably won’t get called up this season, there’s currently nothing standing in his way the second he’s deemed ready for the big leagues. This likely won’t stop his name from being included in talks throughout the coming weeks. While I’d rather keep Mejia on board, if he is in a deal, it has to be an absolute home run. A prospect of his talent can’t be dealt in exchange for a half-season rental who can walk over the winter. This is coming from someone who really wanted the Indians to hang on to former top prospect Clint Frazier. However, dealing him last summer was made acceptable due to the fact the player Cleveland received in return – Andrew Miller – was a top-tier reliever who’s under contract through 2018. The same type of returns would have to be provided to convince me moving Mejia is a good call. If the Indians trade him, it has to be for someone who not only can help now, but who will be around next year and potentially the year after. Bottom line – I have no problem with the Indians swinging a deal for a late-season rental. Just as long as Mejia’s name isn’t included in said deal.